While there is much to be said about the final six seconds of the 1994 Colorado/Michigan game, the set-up is equally important. Both teams had the opportunity to dominate the game, but both fell short. Momentum swayed back and forth before 106,427 fans, the largest crowd to witness a Colorado football game in school history. Midway through the second quarter, the Buffs were putting on a show for the Wolverine faithful. Up 14-3, Colorado threatened to make the game a rout after Kordell Stewart hit Michael Westbrook on a 27-yard touchdown with 7:54 remaining in the half. For the next two full quarters, however, the game was all Michigan. Wolverine running back Tim Biakabutuka scored on a four yard run to pull Michigan to within 14-9 with 1:14 before halftime. Going for a two point conversion to pull the Wolverines to within a field goal of the Buffs, quarterback Todd Collins was intercepted by CU linebacker Matt Russell, preserving a five point lead for the Buffs. The third quarter was a nightmare for the Buffs, as Michigan posted 17 unanswered points to take a 26-14 lead. Less than five minutes into the quarter, Tyrone Wheatley capped a 62-yard drive with a six yard scoring run. A short field goal after the Buffs’ fumbled the kickoff return and a 65-yard bomb from Collins to receiver Amani Toomer gave the Wolverines their biggest advantage, 26-14, with just under three minutes remaining in the third. The Buffs were sluggish on offense, and the game appeared to be well in hand for the home team. Now it was time for the Buffs to mount a comeback, but not before giving CU fans more reason to test their faith. After punting the ball away on its first four second half possessions (not including the James Kidd fumble after a Michigan kickoff), Colorado finally mounted a drive. Commencing with about eight minutes remaining in the game, Stewart methodically passed the Buffs down the field. After Stewart hit Michael Westbrook for nine yards down to the Michigan four yard line, the Buffs had a first-and-goal. Yes, CU was down 12 points, but now they were at point blank range, and still over five minutes remained on the game clock. Plenty of time for two scores and a victory. Stewart took off over the right end. Lunging for the goal line, Stewart lost possession of the ball. Stewart’s fumble was recovered by Michigan, with the Wolverines given a touchback and the ball at their 20-yard line. To add insult to injury, an unsportsmanlike conduct penalty against CU gave the Wolverines the ball at their 35. “What a crusher that is”, said ABC play-by-play legend Keith Jackson. 5:08 remained, but the considered opinion of virtually everyone watching the game was that the Buffs’ chances for a comeback had just been fumbled away. But someone forgot to tell the Buffs, especially their defense. Three runs netted Michigan four yards, but cost CU two precious time outs in an effort to stop the clock. After a short punt return by Chris Hudson, CU had the ball at their own 28-yard line. Now the fun would begin. After two scrambles and a fumbled pitch out of bounds by Stewart, Salaam cut up the left side for 12 yards and a first down to the Buffs’ 48-yard line. “Make no mistake,” said ABC commentator Bob Greise after Salaam’s run. “There is plenty of time for the Buffaloes to score two touchdowns.” A swing pass to Salaam gave the Buffs’ another first down at the Michigan 40. Two passes to tight end Christian Fauria gave CU another first at the UM 24. 2:37 now remained in the contest. After an incomplete pass, Stewart kept the ball on an option to the left for 21 yards to the Michigan three. First and goal, Colorado. “The only way to stop this team is if they stop themselves,” noted Greise about the Buffs. On the next play, a Kordell Stewart pass to the corner of the endzone intended for Michael Westbrook was too high, but Michigan had too many players on the field. The penalty moved the ball to the Michigan one yard line. A pitch to Salaam took care of the final yard. Neil Voskeritchian’s kick was true, and the Buffs were back to within five points, 26-21. The Buffs’ subsequent onsides kick attempt was easily recovered by receiver Mercury Hayes, and it appeared that Colorado and its fans would spend much of the evening grousing about what could have been, and wondering how far the Buffs would fall in the polls the next morning. All that remained for the Wolverines to do was to pick up one first down and end the game. On third and seven, the Buffs jumped offsides, giving Michigan an easier attempt at a game-ending first down. The Wolverines, however, responded in kind with a false start, moving the ball back. After some discussion, five precious seconds were returned to the stadium clock. A three-yard run by Biakabutuka into the line gave Michigan a fourth-and-four at the CU 39-yard line. Twenty one seconds remained. Chris Hudson called for a fair catch of the short punt at the CU 15-yard line. :14 remaining – Michigan 26, Colorado 21 – CU ball at its own 15-yard line. No real question about what had to happen now. Stewart dropped back, hitting Michael Westbrook for 21 yards to the CU 36-yard line. The game clock stopped automatically with the first down. The Buffs hurried up to the line of scrimmage, where Stewart immediately spiked the ball to stop the clock. The 1994 College Football Play of the Year. One of the greatest single plays in college football history. After spiking the ball to stop the clock, Stewart jogged over towards the CU bench for the play call. He made it only half way before being waved back. “Jets, Rocket, Victory” was the play call. In CU football parlance, “Jets” refers to the receivers, “Rocket” means “go long”. (”Victory” apparently means “I hope someone from our team catches the ball”).Three receivers lined up on the left side, Westbrook, Rae Carruth, and Blake Anderson, while James Kidd lined up on the right. “If I were the defense, I’d have a few more guys over there”, said Bob Greise at the snap, referring to the lack of Michigan defensive backs at the line of scrimmage. Most of the Michigan secondary was already thirty yards downfield, awaiting the Stewart bomb. “Stewart, with time,” called Jackson. Yelling was not a problem in Bozeman, Montana. I did not hear Keith Jackson’s words after the tipped ball fell into Westbrook’s arms as I was too busy yelling myself. At the time, my yells were heard as far away as Grand Junction, Colorado. Not because my screams could be heard 500 miles away, but because I was on the phone with Brad G. at the time. I do not remember who called who, but I do remember Brad and I commiserating on the phone as the final moments unfolded. The call was made after the Stewart fumble, when it appeared the game had been lost. It continued as the Buffs slowly crawled back into contention, and was silent as we waited for the final gun “Last play”, we noted, fully expecting to get back to our dissection of the loss a few seconds later. Four turnovers and 102 yards in penalties had doomed the Buffs. Or so we had thought. When Westbrook came down with the ball, I screamed at Brad, I screamed at the television. Even my wife, Lee, who was watching the game with me (albeit impatiently – the game was running long, and we were late for a party), started screaming. It was unbelievable. CU was back in the National Championship hunt! I watched the video from the game over and over again, relishing the final play. I guess you could say that I may have watched it too many times, as several months later, during halftime of our Super Bowl party, I brought out the tape to show our guests. The worn tape broke. (Fortunately, the tear came during the portion of the tape showing Michigan’s punt with 21 seconds remaining. The important portion of the tape was preserved!). No rest for the weary. CU was 3-0, up to #5 in the polls, and the talk of the nation. But the Texas Longhorns, 3-0 and ranked 16th, wanted their own share of the nation’s attention. The Buffs only had seven days to celebrate, recuperate, and prepare for the showdown in Austin. – The 106,427 on hand for the “Miracle at Michigan” represented the first crowd of over 100,000 to witness a Colorado football game. The previous high for a Colorado road game was also against Michigan, when 91,203 were on hand for a game against the Wolverines in 1974. – Kordell Stewart had 379 yards of total offense against Michigan (294 passing; 85 rushing), the third-highest total in CU history. – Kordell Stewart’s pass attempts (32), completions (21), and passing yards (294) were all season highs, as was Michael Westbrook’s 157 yards receiving. – Rashaan Salaam’s 141 yards rushing (on 22 carries) and Michael Westbrook’s 157 yards receiving (on seven catches) marked just the 12th-time in Colorado history in which the Buffs had a 100-yard rusher and a 100-yard receiver in the same game. – On defense against the Wolverines, the Buffs were led by junior safety Donnell Leomiti, who had 12 tackles. Linebacker Ted Johnson and safety Steve Rosga both posted ten tackles on the afternoon. Johnson would go on to be awarded first-team All-Big Eight honors in 1994, to go with second-team All-American accolades from the Associated Press. Rosga and Leomiti both earned second-team All-Big Eight recognition. – The loss to No. 7 Colorado only dropped No. 4 Michigan to seventh place, while the Buffs moved up to No. 5 in the AP poll. Losses to No. 3 Penn State and unranked Wisconsin would drop the Wolverines as low as No. 20 in the polls, with a loss to No. 22 Ohio State in the regular season finale sending 7-4 Michigan State to the Holiday Bowl. There, the Wolverines met and defeated No. 10 Colorado State, 24-14, to end 1994 with an 8-4 record and a No. 12 position in the final poll. This post, about the Michigan game, from the 1994 Season, is filed under Game. I was a grad student at CU and living with my wife and kids in Boulder from 1989 to 1996. We didn’t have a TV, so I got to know CU football by listening to the abrasive tones of Larry Zimmer calling the games on 850 KOA radio. When the game in Ann Arbor was played, we were living in married students housing just two blocks from Folsom Field. On the day of the Michigan game, I once again tuned my radio to KOA to cheer the Buffs on. I followed the ups and downs of the game until there were under 10 seconds left and we were trailing. My emotions got the better of me at that point and I decided to get out of the apartment rather than suffer through the final play, which is such a low percentage shot — especially from that far away — that it was doomed to failure. I opened the screen door and took one step toward the stairs. As the door slammed shut, hundreds of voices cut loose from all the apartments around (full of grad students watching on TV) shaking the buildings in a mighty roar. OMG, I thought, don’t tell me we won? I felt a twinge of guilt at not having gone the distance by listening to the last play. But any guilt was soon washed away in the glory of being on the winning side in an unbelievable victory. I was home in NJ watching the game with my two kids. I came damn close to inadvertently spiking one of them in celebration. Two things I had never paid much attention to – even watching it live on TV – that I noticed this morning watching it again: (1) Stewart took the snap from under center; and (2) Salaam stayed in to block and helped buy Kordell some time when he blocked one of the Michigan pass rushers. As someone who grew up associating big-time college football with the sound of Keith Jackson’s voice, I’m very happy that he was at the mic for this moment. It makes the reliving of it all that much more enjoyable for me. The single most famous play in Colorado football history….and I didn’t even see it. Not only am I a huge CU football fan, but I loves me some science-fiction as well, and that day my roommate and I both had tickets to attend a science-fiction convention in Denver. As much as I wanted to see the game, I wasn’t too worried; I was just going to videotape it (remember VHS tapes, kids?) and watch it when I got home that night. But I really didn’t want to spoil it by knowing how the game ended; I wanted to be an uninformed as possible when I finally hit “play” late that night. So my roommate and I engineered a complex plan worthy of Seal Team Six, to where we would try as hard as possible to keep me uninformed. I wasn’t worried throughout the day; sci-fi fans and college football fans tend not to be one and the same (myself excluded! ), so as expected, I heard nothing during the convention. We didn’t take any chances at Burger King on the way home, however; she ran in and got our dinner while I waited out in the car. As we pulled into our driveway in Boulder, I had her go inside the house and tell our other roommates not to say anything, because I knew nothing and was ready to watch the game. While I was sitting in the car, I heard one of my friends yell: “OH MY GOD, HE DOESN’T KNOW WHAT HAPPENED? ?”, so I knew that it was going to be a good game. Well it was, for a half….as Michigan started to take control of the game, I got more and more depressed and wondered what the heck my friend had been yelling about. Oh sure, it was only 21-26 towards the end of the game, but we had the ball deep in our territory with only 14 seconds left. There’s no way that we won this game, but I’m going to watch it anyway. Kordell lines up behind center to take the snap….AND THE TAPE RUNS OUT!!!! I suddenly heard the sickening sound of a tape rewinding….a tape that did not reveal the ending to the game. I quickly turned to my roommate: “WHAT HAPPENED? HOW DID IT END? ?” She looked all sheepish, and said: “I think Colorado won.” But how could they have? There was only 14 seconds left and they were down a touchdown?? Quick: Turn on CNN and see if we can find the answer….maybe, just MAYBE they’ll have a story about the game. Unfortunately, “Headline Sports” wasn’t on for another fifteen minutes, so we sat there with unbearable tension watching the score ticker go by….with no Colorado-Michigan score to be seen. Lots of women’s lacrosse scores, but that’s not what I wanted to see. JUST TELL ME WHAT HAPPENED!!!! And finally, at approximately 12:20 on Sunday morning, “Headline Sports” came on. Would they mention the Buffs game at all? Then I heard the announcer: “Maybe the most amazing play in college football history, as the Buffaloes stun the Wolverines…” I was probably the very last CU fan in the country to see the play, but after all the hassle, dang, it was worth it. 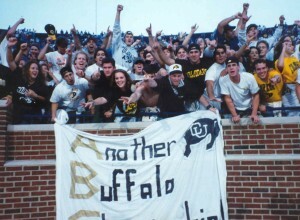 This was the first CU football game I had ever attended and I was a Buff for life following the experience. My family had a couple of University of Michigan season tickets in the south end zone; but I actually despised the Wolverines and would only go to root for the away teams. CU caught my attention during the National Championship runs of ’89 and ’90 and from a distance in the midwest I started following them closer and closer so when they were slated to play at the Big House I was ecstatic. I put on my CU sweatshirt the morning of the game and was ready to go, but before we could leave my mom made me take the sweatshirt off because she was worried about my safety and being harassed wearing a Buffs shirt in a section of Michigan season ticket holders; I was 15 mind you. Once there, the atmosphere in and around the stadium was electric had the feel of big time college football. The game was back and forth until the middle of the 4th quarter when Michigan went up two scores. Although I didn’t have my CU shirt on I was still being mildly harassed for cheering on the Buffs particularly at that point when it seemed like CU was done for. Then CU scored to get within 5 and then got the ball back once more and the rest is history. The site of seeing Kordell heaving that ball so far, having it tipped in the air and Westbrook coming down with it – AMAZING! After the catch the stadium went almost completely quiet and all the UM fans, without saying a word, silently exited through the tunnels. It was a very eerie scene to see that many people just completely dumbfounded and having no words to talk about what they had just experienced. I was gracious in my celebration because it looked as if someone had just pulled these peoples’ hearts out and just as my emotions swung from desperation to jubilation in an instant theirs were going the other way. It was a beautiful moment for me though and from that point on I was sold and went from being a mild fan to being a die hard Buff supporter so much so that three years later I became a student at the University of Colorado and four years after that; a graduate. I’m unsure whether that would’ve been the case had CU not come down with that ball but I know it didn’t hurt and I’ll always have the memory and privilege of that being my first CU game. I’ve been to quite a few great CU games, but this might be #1. I had some of the best seats in the house. My ex-CU roommate’s brother played for Michigan so I was lucky enough to get a freebie from him. I was sitting on the 5o yard line, in the middle of the Michigan player’s section. It was about as hostile as I’ve seen and I’ve been to Lincoln. I was sitting behind Ty Law’s grandma and instituted the CU student mentality and never sat down and made a lot of noise. This wasn’t taken very kindly by the surrounding fans. I had food and insults thrown my way and even had a $200 offer to leave. I can remember the game going both ways and thinking that CU was almost completely dead. I kept trying to calcualte what was needed for them to even have a hail mary’s chance and didn’t think it was too likely. When Westbrook made “the catch” it was like things stood still. I was the only CU fan in a sea of Wolverines and I can distinctly remember someone telling me that I better leave. That was said to protect me more than anything else and with that I was very appreciateive. Later that night, I went to my friend’s apartment and got to meet Brian Griese which was pretty cool even though those guys weren’t very hospitable. Regardless, it had to be one of the most memorable games of my life and something I will never forget. I was at the game with my Dad, Mom, brother and my wife and our five month old son. My Dad, brother and I sat together and Mom and wife with kid in tow sat in a different section. There was a small group of us CU fans around the 35 yard line on the Colorado sideline just about where Kordell launched the hail mary from. I remember my brother and I talking about how CU was the better team but they had too many mistakes, particularly fumbles near the goal line that cost them the game. Obviously that conversation happened before the catch. I remember Kordell scrambling around and him letting the ball go. I didn’t have a good view of the endzone as we were only five or six rows up so my view of the catch was the ball bouncing up in the air and then these two hands reaching up and grabing a hold of the ball. I did not know which team caught it until the ref standing in the opposite corner of the endzone started running towards the play and signaling a touchdown! The next thing I remember was how loud it was right around me and how quite the rest of the stadium was. What a great moment to have witnessed. As for my wife and child, they left the game early since the crowd noise was too much for my son. My wife was forced to listen to the end of the game on the radio out at our tailagte on the golf course just south of the stadium. As CU scored the winning touchdown she began jumping up and down and cheering. This behavior drew some really crazy looks from the Michigan fans. When she noticed them looking at her she said, “You’ll have to excuse me, I’m a CU fan and we just won the game!” The Michigan fans looked at her like she was crazy. They then asked a guy sitting in his car if it was true what the crazy CU fan said and he confirmed it. The look on their faces must have been classic. Not that I have ever left games early, but this game is a prime example of why I always stay until the score board reads all zero’s. Our group had seats in the first couple of rows of the CU student ticket section on the same side of the field but up from the goal line in the opposite endzone. Before the final play, I remember saying to our group that it had still been a heck of a game. Then Kordell started dancing around and all I could think was “Please don’t get sacked”. I was able to see the ball leave his hands, but then the entire crowd went to their feet. Our position on the field meant that we had to turn our heads 90 degrees over our left shoulder and really with everyone standing, no one in our group saw what happened next. We simply could not see over the crowd to our left. I was able to pick up the referee on the opposing side of the field from ‘The Catch’ and all of a sudden, his hands went up. TOUCHDOWN! I had barely a moment to register what that meant before the entire CU student section came flooding down behind us in a wave of pressure pushing us to the rail. Luckily for all involved the rail at the Big House is quite easy to get over if one must, and the pressure wave subsided very quickly. It was a mad house with everyone looking around asking what had happened. We knew we had won, but no one could answer how. I always found it funny that we were at the game, but we didn’t actually SEE the catch until we got to a bar back in Chicago that night. Here is a link to a personal photo taken with my camera by Christian Fauria when he came down to thank the CU fans on our end. I am the one holding the end of the sheet with the Buffalo on it. Great website. I attended the CU Oklahoma State game last weekend. Met Blake Anderson at Dolan’s after the game. We recounted the catch in 1994 over a few beers. Trying to do a little research on the play and found your website. Fantastic. Keep up the good work and GO BUFFS!! We will return to glory. I was at that game and was sitting about 25 yards from where Westbrook caught the ball. I was thinking two things before the play. 1) That Kordell couldn’t throw it that far and 2)that it was going to be a long night in Ann Arbor. I saw the ball get tipped right in front of me and was screaming my head off before Westbrook even hit the ground. I have the tape of the game and am shown on TV with my friends cheering around a CU flag in the stands as the telecast came to a close. What a great day!! !